2019 and Part II: Revisions and Complication Management in Geneva in 2020.
interactive case discussion and round tables, and dry lab hands-on workshops. The target audience is: recently qualified neurosurgeons and neurosurgeons specialised in spinal neurosurgery as well as orthopaedics surgeons interested in spinal procedures; last year residents are also welcome to attend. internationally recognized speakers from various European countries. *Faulty names with a star are unconfirmed. Claudius Thomé, MD completed his medical education at the Ludwig-Maximilians-Universitaet Munich, Germany and at Stanford University School of Medicine, Stanford/Ca., USA followed by his residency in the Department of Neurosurgery, University of Heidelberg, Campus Mannheim (Chairman: Prof. Dr. P. Schmiedek) (1995-2001). He completed several fellowships: 2nd Institute of Physiology, University of Heidelberg; Dept. of Orthopedics, Klinikum Karlsbad-Langensteinbach; Department of Neurosurgery, Barrow Neurological Institute, Phoenix, USA; and, Department of Neurosurgery, Mayfield Clinic, University of Cincinnati, USA. His thesis was entitled “Evidence-based spine surgery: Evaluation of new surgical techniques using randomized studies” (2005). 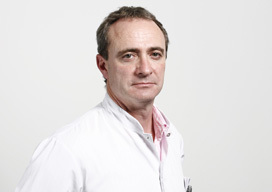 Dr. Thomé’s surgical specialties are: cerebrovascular surgery, skull base surgery and complex spine surgery, and his main research fields are: cerebrovascular diseases, neuromonitoring in brain injury (TBI, SAH) as well as evidence-based and minimally invasive spine surgery and regenerative medicine in spinal disease. After serving as Professor and Vice-Chairman at the Dept. of Neurosurgery, University of Heidelberg, Campus Mannheim from 2007 to 2009, he was appointed Full Professor and Chairman of the Dept. of Neurosurgery, Medical University Innsbruck, Austria in 2010. Dr. Thomé is chairman of the Spine Section of the German Society of Neurosurgery and President of the Austrian Spine Society. He currently serves as board member of the Austrian Society of Neurosurgery, the German Society of Neurosurgery, the German Spine Society and AO Spine Austria. Dr. Thomé´s commitments in the societies focus on education as training delegate of Austria in the European Association of Neurosurgical Societies and as member of the education committee of the German Spine Society and the Spine Society of Europe. Please click on the button below to download the preliminary programme. Please note this is still subject to change. An application for EACCME accreditation will be submitted in due course. Fees will be published shortly. EANS / EUROSPINE Members will be entitled to a discount on the standard fees. *EANS Members will need their membership number to register with the discounted fee. EUROSPINE members should contact petra.koubova@eans.org for a special discount code. The registration fee includes all tuition costs and subsistence during the event (coffee breaks and lunches). Accommodation is NOT included in the registration fee. There will also be a ticket for a Networking dinner, sold separately. We respect your privacy. Your details are never disclosed to third parties. You may have heard of us before, you may know us well, but if you don't, here is some information about who we are and what we do. The European Association of Neurosurgical Societies (EANS) is a fast-growing, independent association, both of European neurosurgical societies and of individual neurosurgeons from all over the world. We recognise the huge part that e-learning now plays in the advancement of scientific knowledge, and are delighted to be able to provide a comprehensive online library of neurosurgical material via the EANS Academy. But we know too, that there is no substitute for “being there”, and therefore offer a growing number of fellowship and observership programmes, both on our own account and in collaboration with selected partners. Membership of the EANS starts from at little as €75.